MainAll NewsDefense/SecurityReport: Israel Accepts, Hamas Rejects Truce Ext. Report: Israel Accepts, Hamas Rejects Truce Ext. Israeli official tells international media that Egyptian truce has been extended; Hamas insists fighting to resume. Israel has conditionally agreed to extend a ceasefire that ended the month-long self-defense operation in Gaza, an Israeli official stated on condition of anonymity. Reuters reports Wednesday night that the official did not give details about the extension, only that it had been agreed upon. "Israel has expressed its readiness to extend the truce under its current terms," the official merely stated, referring to the 72-hour "humanitarian ceasefire" brokered by Egypt overnight Monday/Tuesday. The ceasefire took effect at 8:00 am Tuesday and was accepted by both Israel and Hamas; it is due to expire Friday. 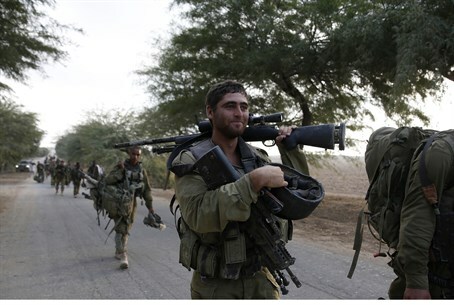 Israel has yet to officially confirm its extension of the ceasefire agreement. In the meantime, Hamas has rejected the idea of an extension entirely. "Israel and Hamas will resume fighting immediately at the end of the 72-hour ceasefire, at 8:00 am Friday," a Hamas spokesperson stated Wednesday night. Earlier Wednesday, the IDF announced a limited pullout of the Gaza border area, leaving 55,000 soldiers near the fence and discharging some 30,000 reservists. IDF forces already officially left Gaza itself earlier this week. On Wednesday night, Prime Minister Binyamin Netanyahu stressed in an international press conference that the IDF stands at the ready in the event the current ceasefire is violated, however. "We closely monitor the implementation of the ceasefire on the ground, and we are holding position in the event it is violated," he stated. "The army is in the field, with reinforcements, to meet any scenario." Thirty days have passed since Operation Protective Edge was launched on July 8. Sixty-four IDF soldiers and three civilians were killed since the fighting began, and Hamas fired more than 3,500 rockets on Israel.